Mrs Gurmel Kaur from Bhatinda, the wife of Sapper Jagraj Singh received a letter from the Bombay Sappers Headquarters in December 1971 informing her that her husband had been killed in action on the 3rd December 1971 during the 1971 Indo-Pak War. 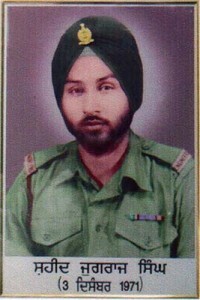 Sapper Jagraj Singh’s body, army identity bracelets and belongings were never returned to his family. Like many other Indian prisoners of the 1971 Indo-Pak War, Sapper Jagraj Singh’s name is not included in the official list of the ‘missing’ prisoners of war exchanged annually between India and Pakistan. The official list refers to ’54 missing Indian POWs’, whereas cases that have subsequently come to light reveal that the number of Indian prisoners of war captured and detained by Pakistan were significantly more in number than the 54 officially stated by the Indian Government at the time. There has been allegations by Indian civilian prisoners captured during cross border breaches, that they met Sapper Jagraj Singh in a Pakistani prison during their incarceration in the same prison.